FRANKFURT (Reuters) - Deutsche Bank defended its record in fighting money laundering on Thursday after the Financial Times reported it had processed 31 billion euros ($35 billion) more in questionable funds for Danske Bank than previously thought. A Deutsche Bank spokesman declined to comment on the FT article. He said, however, that it was not Deutsche's responsibility to vet Danske Bank's customers and that business ties with the Danish bank had been cut in 2015. The sum came on top of $150 billion Deutsche cleared for Danske's Estonian branch from 2007-15, meaning it handled four-fifths of the flows from the Danish bank's clients in Russia and the former Soviet Union, the FT reported, citing people familiar with the matter. "We have continuously intensified our efforts over the past years against money laundering and tax evasion," Deutsche's Chief Financial Officer, James von Moltke, said in a statement. 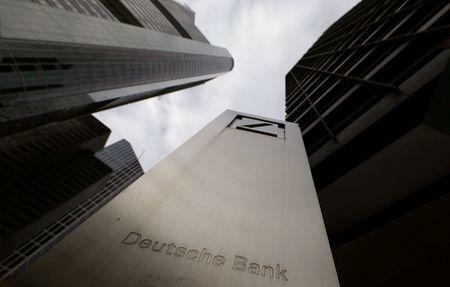 Prosecutors raided Deutsche's Frankfurt offices for two days last week as part of a probe into whether it may have helped customers set up companies in tax havens to skirt money-laundering safeguards. Von Moltke, speaking earlier to CNBC, said he was not aware of any wrongdoing on Deutsche's part in the Panama Papers case and noted that a subsidiary under investigation was sold earlier this year. Deutsche's shares slid by 4 percent on Thursday to a new historic low, dealing a fresh blow to Chief Executive Christian Sewing's bid to stabilise the bank after three years of losses under previous management. That legacy has hampered his attempt to return Deutsche to its roots as Germany's premier commercial bank. Sewing has repeatedly rebutted speculation that Deutsche will end up having to merge, possibly with fellow struggler Commerzbank . "The current management has conducted itself with a real focus on our compliance and our control systems," he said. "We’ve made enormous investments and these investments are showing themselves."